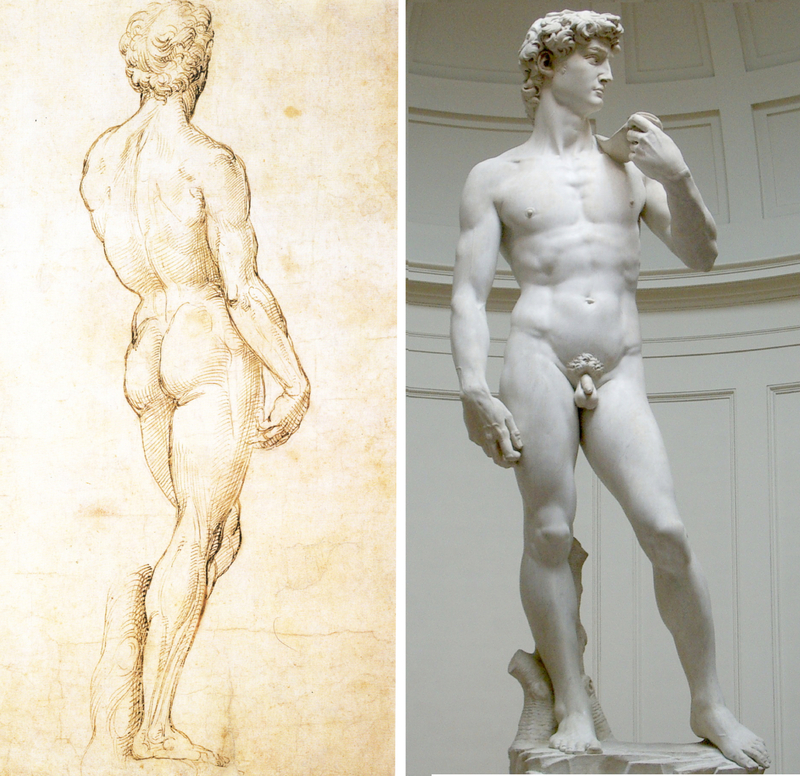 I explained how David represents both sculptor and sculpture, eliminating the distinction between artist and model. 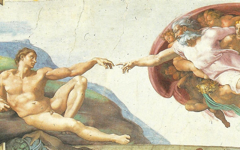 This means that the young David with his stone sling-shot (right) pauses before attacking a giant (Goliath) just as Michelangelo with his hammer turned a giant stone into the small David. This makes David both the "artist" and "masterpiece" while being both victor and victim within the story. 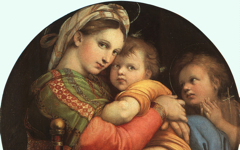 Raphael would have seen all that instantly. The unity of art is such that any great artist in any period would see that these simple sketches are pregnant with meaning. Historians, on the other hand, unaware of art's unity, see nothing but appearances colored by the prejudices of their own period and the one they study. Don't be fooled. 2. 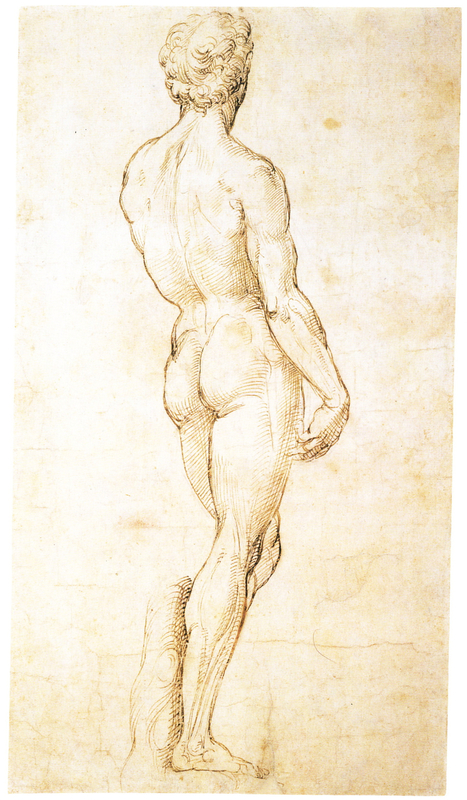 Simon Abrahams, "Michelangelo's David (1501-04)", published on EPPH, 17th Nov. 2011. 3. Many sages in the past have advised that any action by anyone proceeds from rest and that to act well requires relaxation, balance and a brief pause, however short, before starting. 4. K. T. Parker, Catalogue of the Collection of Drawings in the Ashmolean Museum, vol. ii, The Italian Schools (Oxford University Press) 1956, no. 522 recto. Philip Pouncey and J. 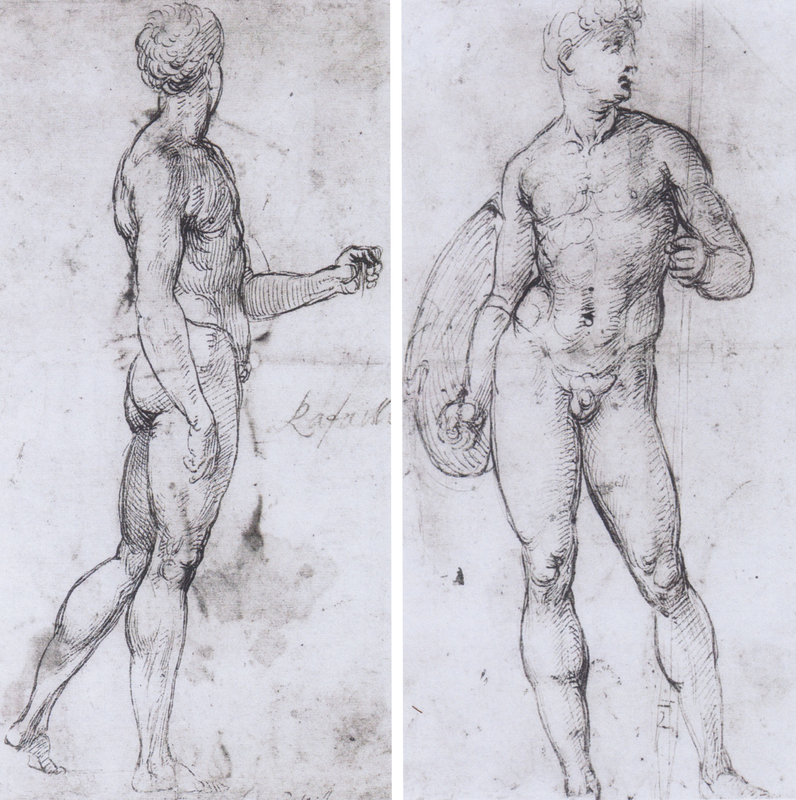 A. Gere, Italian Drawings in the Department of Prints and Drawings in the British Museum: Raphael and his Circle, 2 vols. (London) 1962, p. 12, no. 15 summarize previous opinions. Both cited in Kwakkelstein, op. cit, pp. 37 & 56, n.3. 5. For an explanation for a head turned over a shoulder, see Simon Abrahams, "Over the Shoulder Poses", published on EPPH, 25th Feb. 2011. To understand why a hand near the edge suggests an artist at work, see Michael Fried, The Moment of Carvaggio, A.W. Mellon Lectures in the Fine Arts (Princeton University Press) 2010, pp. 1-16 and Abrahams, "Pointing at the Edge", published on EPPH, 1st Dec. 2012. Original Publication Date on EPPH: 28 Nov 2014. © Simon Abrahams. Articles on this site are the copyright of Simon Abrahams. To use copyrighted material in print or other media for purposes beyond 'fair use', you must obtain permission from the copyright owner. Websites may link to this page without permission (please do) but may not reproduce the material on their own site without crediting Simon Abrahams and EPPH.